It is believed that one in 20 people will develop colorectal cancer in their lifetime, which makes it the third-most common form of cancer in the U.S. In Europe, it is known to be the second-most common form of cancer. Surgery is the most widely used platform of treatment, however surgery cannot guarantee the complete removal of the tumor and can result in cancer cells being retained, potentially causing a recurrence of the disease and high risk of metastasis. Although many patients remain free of cancer for months or sometimes even years after surgery, tumors recur in almost 50% of these cases. Common therapies given after surgery that help prevent tumors from returning do not have the required capability to differentiate between cancerous and healthy cells, which could cause major side effects. The journal Nature Materials published a paper where researchers at MIT illustrate an adhesive patch that can attach to the tumor site before or after the surgery in order to provide a triple-combination of gene, photo, or light-based and drug therapy. Natalie Artzi, principal research scientist at MIT’s Institute for Medical Engineering and Science (IMES) and assistant professor of medicine at Brigham and Women’s Hospital, headed the research. She states that locally releasing this triple combination therapy at the tumor site, might help to strengthen the treatment. The conventional approach to treat cancer today is the use of systemic or whole-body therapies that, including chemotherapy drugs. The lack of specificity in anticancer drugs could lead to production of unwanted side effects when administered systemically. As only a small portion of the drug reaches the tumor site, the primary tumor is not effectively treated as it should be. Recent research in mice discovered that only 0.7% of nanoparticles that were systemically injected reached the target tumor. This means that we are treating both the source of the cancer — the tumor — and the metastases resulting from that source, in a suboptimal manner. That is what prompted us to think a little bit differently, to look at how we can leverage advancements in materials science, and in particular nanotechnology, to treat the primary tumor in a local and sustained manner. A team of researchers have designed a triple-therapy hydrogel patch, capable of treating tumors locally. This method is efficient because it not only treats the tumor but also cures cells left at the site after surgery, preventing the cancer from metastasizing or recurring in the future. The patch contains gold nanorods, which heat up when the local area is exposed to infrared radiation. This method thermally ablates or destroys the tumor. These nanorods are also engineered with chemotherapy drugs that are released to treat the tumor and its surrounding cells when heated up. In the last step, gold nanospheres that do not heat up after being exposed to infrared radiation are used to deliver gene therapy or RNA to the site for suppressing an important oncogene in colorectal cancer. Oncogenes are genes that convert healthy cells into tumor cells. 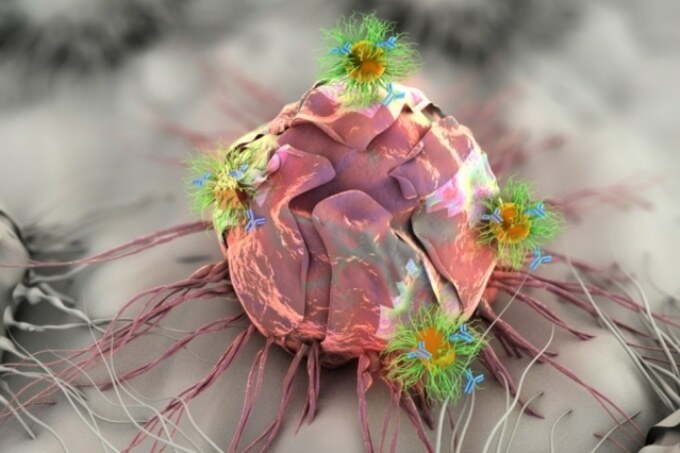 The researchers imagine that a clinician could eliminate the tumor, and then implement the patch to the inner surface of the colon, to assure that cancer recurrence cells are retained at the site. The patch gradually releases various therapies as it degrades. Artzi points out that the patch also acts as a neoadjuvant, a treatment developed to contract tumors before they are removed. When the treatment was performed on mice, the researchers observed that cancer reoccurred in 40% of cases where the patch was not implemented after removing the tumor. However, application of patch after surgery, resulted in complete remission. The triple-combination therapy was successful in destroying the tumor even when the tumor was not removed. Mauro Ferrari, president and CEO of the Houston Methodist Research Institute, who was not involved in the research, stated that the research is an explicit and unparalleled synergy of three concurrent modalities of treatment. Unlike the existing colorectal cancer surgery, this treatment can also be used in a minimally invasive manner. In the next development step of the research, the researchers are expecting to move to experiments in larger models, to use colonoscopy equipment to diagnose cancer and also to administer the patch to the site of a tumor, when detected. This administration modality would enable, at least in early-stage cancer patients, the avoidance of open field surgery and colon resection. Local application of the triple therapy could thus improve patients’ quality of life and therapeutic outcome.